First Environmental Nationwide is a self-performing industrial cleaning contractor specializing in hydroblasting, dust management, vacuum truck services, 24/7 emergency spill response, and much more. Our work is tough, dirty, and extremely important. Without our services, our customers aren’t able to do their jobs. When you put your boots, safety gear, and hard hat on, you’re ready to go out and be a hero for someone that day. 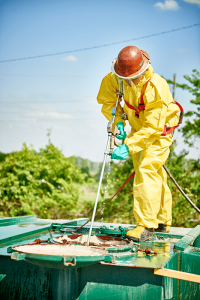 Emergency spills are dangerous and hydroblasting is just plain tough – but someone has to answer the call and do it. Are you ready to be a hero? Check out our job openings and apply today! We have locations in Atlanta, Macon, Savannah, and Waycross. Each of these branches is constantly looking for qualified workers who are ready to work hard and do good for others. We are always on the lookout for workers who are ready to get their hands dirty and earn their paycheck. First Environmental is seeking entry-level workers and experienced industrial workers, alike. An opportunity to make a difference through work that is important, challenging, and rewarding. The chance to be part of a growing company where opportunities for advancement are frequent and teamwork is vital. We Like Our Job, We Make it Happen, We Value People. We have multiple job openings. If you or someone you know would like to learn more, call Bryan at 478-342-1692 or click here to view jobs.